Franks tours Baghdad; Bush:'end sanctions'. CAIRO(ASN-News & UPI), 14:30, 17 April 2003. President George W. Bush has called on the United Nations Security Council to end Iraq's economic isolation, while the commander of the U.S.-led forces Gen. Tommy Franks entered Baghdad for the first time since the war began four weeks ago. Four people were shot and killed as violence continued in the northern city of Mosul. Coalition commanders have admitted U.S. troops shot and killed a number of Iraqis during a protest in Mosul. U.S. forces had earlier denied responsibility for the killings. Brig. Gen, Vincent Brooks said U.S. Marines fired at demonstrators earlier this week after they came under attack from people shooting guns and throwing rocks. "It was lethal fire and some Iraqis were killed as a result of that," said Brooks. "We think the number if somewhere on the order of seven. And there may have been some wounded as well." Meanwhile, CNN reported that Secretary of State Colin Powell expects to travel to Syria "to have very candid and straightforward discussions" with President Bashar Assad. Powell's trip comes during a week of increasing diplomatic pressure from the Bush administration, which has accused Syria of producing weapons of mass destruction and giving sanction to former Iraqi government officials. Bush on Wednesday called for the removal of the sanctions regime imposed on Iraq after Saddam Hussein invaded Kuwait 13 years ago. "Now that Iraq is liberated the United Nations should lift economic sanctions on that country," Bush told a crowd of workers at a Boeing aircraft factory in St. Louis. The president said Saddam's regime had "passed into history" and promised the lives of the Iraqi people would be "better than anything they have known for generations." Scott McClellan, a White House spokesman, said Wednesday, "Now the Iraqi people are liberated, the United Nations should lift the economic sanctions on Iraq. He said ending the sanctions would help restore a "normal trading relationship as soon as possible." McClellan said the United States was preparing to table a U.N. resolution ending the U.N.-administered "oil-for-food" program, allowing Iraq instead to sell its oil reserves freely on world markets. However, before sanctions can be lifted or suspended, the question of whether Iraq still has weapons of mass destruction will have to be answered. The requirement that Iraq demonstrate it is free of weapons forms a central part of the existing U.N. resolutions. In Baghdad, Gen. Franks told reporters that his trip to the Iraqi capital was partly an "emotional event" to show appreciation to commanders "who have done the bone-crushing hard work." 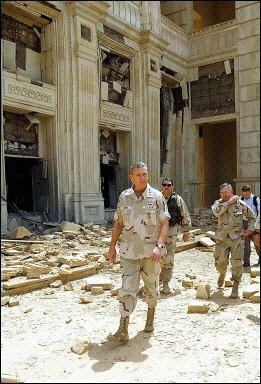 Franks, the head of U.S. Central Command, briefed President Bush of his visit from one of Saddam's former palaces. Franks declined to give details about his conversation with the president, saying that he "simply provided the president and the National Security Council a statement of where we are in the operation." "I think over the past week we have seen water being turned back on in the country, we have seen power being turned back on in this country, we've seen hospitals going back to work all over the country," Franks said. He cautioned that there was still fighting going on in Iraq. "Everyday, we see remnants of what we call Arab fighters, or foreign fighters, who have come in from a number of other countries," he said. Meanwhile, the United States has put a price tag of more than $300,000 on the head of the former Iraqi president, whose whereabouts and status remain unknown. Posters distributed around Iraq also offer a reward for the arrest of other Iraqi leaders. Above the names and photos appear the words: "These men are wanted for crimes against the Iraq people."